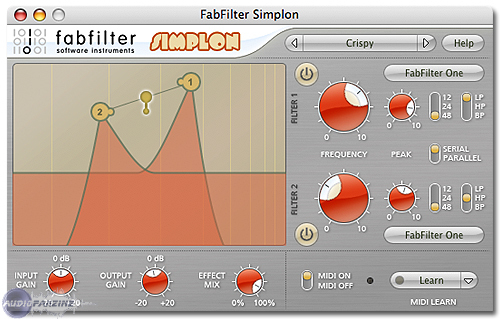 Simplon, Software Filter from FabFilter. This plugin runs perfectly fine on a Mac Pro Duo running Snow Leopard and Logic 9. There is no need for a manual. This basically a simple filter plugin that gives you control of two filters on the same channel. The general configuration is simple enough to understand after a minute or two if you are familiar with Filters. You get a Low pass, High pass and Band Pass with options to select the Filter "Slope" and "Character." All functions are easily accessed via the front face. The Simplon has never demonstrated any strange behavior whatsoever. No crashes or glitches. In all honesty I use FabFilters Micro Filter much more. I'm pretty sure that the Simplon is just two micros in the same plugin. They both sound fantastic in regards to digital Filters. Very clean and accurate and especially smooth. I do feel however it can get just a little harsh in high frequencies, but I am slightly biased by owning some Moog Filter Hardware. In contrast to the Micro, this one allows you to create some interesting Filter Behavior but personally I don't use it that much. It can be a nice effect on drums and overall mixes for remixing. I could see using it for performance remixing kinda stuff as well, but have yet to do that. I have been using this plugin sparingly for about 5 months. What I like most about this plugin is the standard Fab Filter Undo/Redo buttons. Not enough plugins have these and they are indispensable in almost every situation. Other things to note is that FabFilter makes some of the best Plugin filters I have ever heard. Only thing I have to say negative is that this GUI isn't any where near as pretty as the others FabFilter offers. Excellent precision with smooth knobs and filter sweeps. The quality is some of the best I've heard in the computer world. I have used mainly my Moog Filters but would use the built in Logic filter as well. Yes, I recommend FabFilter highly. 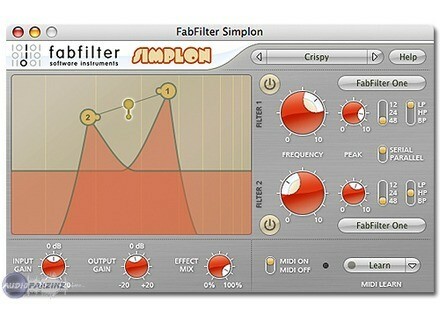 The FabFilter Simplon is a basic two band filter plug-in that is essentially a simplified version of FabFilter's Volcano 2 filter plug-in. I'm not the owner of the version of this plug-in that I've used, rather a producer who I'm an assistant to has most of the FabFilter plug-ins at his home studio and I've used them all there. He uses their plug-ins on almost everything, so it was kind of mandatory that I learn them as well, and boy I'm glad I did as they are really some great plug-ins! The Simplon in particular is really easy to use, with each of the two bands giving you control over the frequency and peak, as well as three different modes for each. Each band also gives you to option to set the db range to either 12, 24, or 48, as well as using each as either a band pass, low pass, or high pass. There are also input, output, and mix levelers included here. Since this is a somewhat unique make up, if you're new to filters and EQ's it might be a good thing to have the manual around just in case. The FabFilter Simplon presents what this company does best, and that's making high quality, versatile and flexible filter plug-ins for your DAW. The Simplon has a unique make up to a degree, but this only furthers what is possible with the plug-in. In fact, FabFilter advertises that there are 27 different combination types available here depending on the modes you're using, which is really something considering it's only two bands to begin with. The sound, like all FabFilter plug-ins, is outstanding through and through as this is as clean of a filter as you'll find in the plug-in world. If you don't have the money to drop on the full Volcano 2 of which this is a simplified version of, the Simplon is a fine substitute for any DAW.